The name of Walla Walla is derived from an Indian word that is loosely translated "many waters." Ancient maps show the end of the trail from Westport, Missouri through Ft. Boise ending at "Wallah Wallah." This congregation at Dixie was planted very close to the western end of that trail. The town name was derived from the favorite song of the pioneer Kershaw brothers. 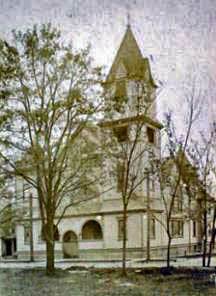 The Dixie church in Walla Walla County began meeting about 1856. It is located on Highway 12 ten miles east of Walla Walla at the confluence of Upper Dry Creek and Mud Creek. Early documents show that it was chartered (became a legal entity) in 1874 and incorporated in 1888, a year before Washington became a state. The Castle Rock congregation is the only Restoration Movement church in Washington State that is older. Charter Members in 1864 included William T. and Sarah Barnes (overland in 1852, became a Representative in Washington Territory) ; Philip and Clarinda Beal; James and Jane Lamb; Elizabeth Noland; and John and Margaret Ware. Added names signing the Articles of Incorporation in 1888 were G. W. Clancy, R.G. Clancy, C.R. Frazure and G.W. Sanders. While the original meeting place may have been several miles away, the church moved into Dixie proper in 1876 and met for a time in the log schoolhouse. They built their own frame building at 1st and Actor Street in 1889. This early building is among 80 included in Early Churches of Washington State by Arnold and Esther Pearson. This is the oldest standing Christian Church building in Washington State. It is also the oldest church building (of any kind) still in use for worship. Neal Cheetham preached here in 1884-1886. Other preachers were J. B. Daisley, Jasper Vincent Crawford and Supplina Hamilton. The town has a population of about 200 and the church is meeting regularly in 1998. See the Secretary of Washington State's entry. Bundy Hollow is about nine miles east and south of Waitsburg on Bundy Hollow Road. The presence of the Bundy Hollow Cemetery with 64 headstones tells us the area was once a thriving community. The district has Dayton, Washington addresses. Writing in the Pacific Christian Messenger of August, 1877, George Washington Richardson said that he had organized the Bundy Hollow Church since beginning work in June. He probably means that he formally organized the existing 22 believers. 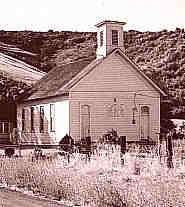 The church met in the Bundy school house. Names like Hess Brown, Carrol Musgrove, and W. F. Anderson were attached to the congregation in its earliest days. The congregation later merged with the yet-to-be-established Waitsburg church. This group is to be distinguished from the Spring Valley just east of Bethel at the northern edge of Polk County in Oregon. There was a church there, also. Look for this Spring Valley on the Middle Waitsburg Road between Waitsburg and Walla Walla. At an earlier time, Spring Valley was noted for its wheat. Now it is famous for its wines. Supplina Hamilton was the leader at Spring Valley, four miles from Waitsburg. The church met in the school house and may have been started in 1870. The following year, they reported 28 members. In 1873, Solomon Gerking and David Harris represented the congregation at the first annual meeting of churches east of the Cascades, held at Waitsburg. Like Bundy Hollow, the congregation later merged with the yet-to-be-established Waitsburg church. This congregation in rural Walla Walla county dates prior to 1867. It is 19 miles northeast of Walla Walla on Highway 12. The town was named in honor of Sylvester M. Wait, a flour mill owner and had previously been known as Delta and Horsehead City. A visitor in 1871 described Waitsburg as "the most enterprising and thrifty town except Walla Walla in the whole valley." To give your readers an idea of the crowded state of things here, I will just say that we have been camping out for nearly six months because we could find no house suitable to attempt to winter in. We are now building in the town of Waitsburg. It appears that Mr. Richardson moved his family to Salem for a short while late in 1878. He made a passing reference to embarassment and afflictions in Washington Territory and stated his desire to return. While he was in Salem, two of his daughters died from typhoid fever. The 1880 Federal Census shows G. W. Richardson back living and preaching in Waitsburg. Suzzie was added to their family while George and Martha lived at Waitsburg. In 1883 the church consolidated with Bundy Hollow and Spring Valley, forming a congregation of 60 saints. Organizing was by "Elders (Supplina) Hamilton and Granville Golestein" and the meeting place was a school house. Cornelius (Neal) Cheetham was the first minister, beginning in 1884. He spent about 25% of his time with the nearby Dixie congregation. Cheetham was born in western Pennsylvania near Pittsburg in 1845. 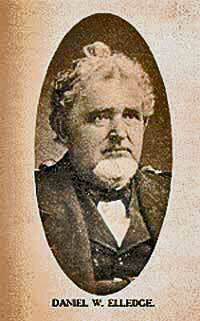 He was a graduate of Oskaloosa College in Iowa and became a minister in 1872. In 1879 Neal Cheetham came from Iowa to Washington and located in Waitsburg. He is an able minister of the gospel and has done much to give stability to the churches in Eastern Washington. He has served in the State Legislature (in 1895) and was for four years State Auditor (beginning in 1897). He has remained faithful to the cause of Christ, an incorruptible Christian Statesman, and still preaches the gospel (1904). John Brown's dates may have been off a year or so because the 1880 census does not show Mr. Cheetham in Waitsburg. He may have lived in Walla Walla at first. Jasper V. Crawford was the minister in 1893. He had been an elder there as early as 1883. He apparently remained in Waitsburg until moving to Enterprise, Oregon in 1898. Barton S. Riggs came that year. He reported to the Christian Standard: "63 added in the last five weeks." Waitsburg, Feb. 6. -- I am in the fourth week of a meeting here with my home church. There have been 86 additions -- 68 confessions, some Baptists, some restored and some by letter. There were 2 confessions and 1 from the Baptists just before we commenced this meeting, making 89 since Jan. 1. Mr. Walden later reported the local membership to be 236. Early leaders at the Waitsburg Church included James C. Arnold, Charles and Margaret May Lewis Brown, Leroy Brown, James P. Bruce, William P. Bruce, Jasper V. Crawford, Abraham C. Dickinson, Thomas J. Hollowell, Matthew McCauley, Joel Perkins, Mrs. Poulson, James Strong, Myrtle Wheeler and Samuel Wilson. I send you a brief notice of the proceedings of the annual camp meeting of the Walla Walla and Columbia counties, held with the Church of Christ at Waitsburg, on June 11, in a beautiful grove owned by Bro. Dickenson. A preliminary meeting was held on Friday evening in the meeting-house, at which a preparatory address was delivered from Acts x.33. The missionary convention opened properly on the camp-ground, on Saturday morning, with singing the songs of Zion and the reading of an appropriate lesson in Ps. cvii, after which another plain and wholesome discourse was delivered on "How to keep in the love of God." In the afternoon the brethren and sisters came pouring in from Dayton, Bunday, Dixie, Touchet and Walla Walla. We soon had a very large and appreciative audience to listen to another befitting address by our earnest co-worker, Bro. Morgan of Dayton. Having Bible class in the morning, which, by the way, was surprisingly interesting. Preaching at 11 A.M. and at half-past 2 P.M. Business meetings at 4 P.M. and prayer and social meeting at 6 P.M. This order continued till the middle of the week, when, by common consent, we added preaching service at 8 P.M., which contributed largely to the interest of the meeting. . . .
Our meeting was very profitable, the singing enjoyable, being led by our devoted and efficient leader. Bro. Crawford. The brethren and sisters felt encouraged and strengthened to work more earnestly for the cause of Christ. The immediate result of our meeting was three persons being baptized into Christ, one yet to be immersed, two from the Baptists, two by relation, one reclaimed; the last one mentioned, we trust, will now make himself useful in the Master's cause. The grammar and spelling of the original have been retained. Central Christian Church of Walla Walla has established 1884 as their founding date, but 16 years earlier overland (1865) pioneers Daniel W. and Katie Elledge had appealed through the widely-read Christian Record, published in Indianapolis, Indiana for help with a new group in "Walla Walla City." The appeal may have had some results because the group reported a membership of 60 in an 1871 report messengers made in Oregon. Daniel and Katie had moved to Walla Walla from a ministry in Scio, Oregon. Daniel had preached at Rock Creek on the first Sunday in November of 1868 and then left immediately for Walla Walla. I obtained the use of the United Brethren's house to hold a meeting in, and delivered one discourse yesterday, day and night. I made an appeal to ascertain how many brethren were present that desired to organize a congregation in the city upon the Bible alone, and fourteen responded. So we appointed a committee of three to ascertain what could be done in securing a suitable location, and means to build a house for the worship of God. So the matter now stands. What can be accompished, remains to be seen. At a meeting on the Walla Walla river, conducted by our Evangelist, Eld. D. W. Elledge, commencing on Saturday, January 7, 1871, and continuing six days, with the assistance of Bro. J. C. Derrick. The meeting was productive of the best results. 27 additions were obtained�fifteen by immersion�and ten were obtained at a previous meeting on Whiskey Creek, by Bro. Elledge. Long may he be spared to work in the cause of our Master. The Christian Messenger reports on a gospel meeting at Walla Walla during June of 1875. H. M. (Mac) Waller and John Moses Harris, both from Oregon, were the preachers. Charles Hubbel Hodges was present. There are profiles of D. W. Elledge and Mac Waller. Preacher Neal Cheetham was also involved in those early days. (Cheetham is pictured above.) During 1882, he preached every other Sunday. That group of 14 stopped meeting for a while. However, in 1884, members met at the home of Mrs. Davenport with J. B. Daisley as the spark and the church was reorganized and called First Christian Church. There were 10 ladies and one man signing the records as charter members: Mr. and Mrs. F. Bowman, Mrs. Davenport, Mrs. Kates, Mrs. Robert Kennedy, Mrs. Jacobs, Mrs. John McClees, Mrs. Merriman, Mrs. Reynolds, Mrs. Joe Smith, and Mrs. Nancy Wiseman. �The brethren and sisters of the Order of Christian Workers have pledged $100 toward the work. For years they�have met and worshiped in a small, poorly lighted, poorly�heated, and poorly furnished hall, and these capital sisters�have paid the rent, paid for seating, lighting and warming�the hall, paid for the organ, and partly paid the preacher�who visits them sometimes once and sometimes twice a�month. They have had no resident pastor for some time�since, but they've kept up their really fine Sunday School�and regularly met and had song service, prayer and Communion service. I have been in this city since the first of January. Eleven persons have been added by letter or statement. This is one of the most important fields in the Territory. The church is weak and has no house, but the prospect is good, and we hope by faithful work to build up a strong church. Mr. Foster resigned his work October 1. Staying less than one year, he returned to Georgia. He was followed by J. B. Johnson. Other preachers before the church had its own building include J. H. Hollis and R. H. Lotz. On April 3, 1892, the church dedicated its first building. William F. Cowden spoke on "The Dignity and Glory of the Man Christ." At the dedication of the building in 1892, the Oregon - Washington Railroad & Navigation Company transported all who desired to attend from Dayton, Waitsburg or Dixie for 25� round trip! The property can be located on a bird's eye view of Walla Walla. John B. Daisley, the energetic Scotsman, was called as the minister at that time. He had been preaching at Milton, Oregon, just to the south. John Fletcher Ghormley moved here to lead the work in 1895. Ghormley was described as vigorous and energetic, with a sensitive, intelligent face, deep-set eyes and a luxurious moustache. He was 44 when he arrived. Two years later, he moved on to First Christian Church in Portland, Oregon. L.O. Herrold began his work in 1897. An interesting entry in early church records requests " 'that some giddy young girls and boys be seated with their parents, with the hope that the parents cooperate in helping to keep order.' Also it was further recommended that a suitable person be selected as church marshal, 'whose duty it shall be to keep order and see that the books are taken care of by those who use them.'" A later entry reads: ". . . 'unruly attendants' caused the board to ask the mayor of the city to deputize two church members to act as part of the police force with neither pay nor uniform." Prescott is eight miles west of Waitsburg. 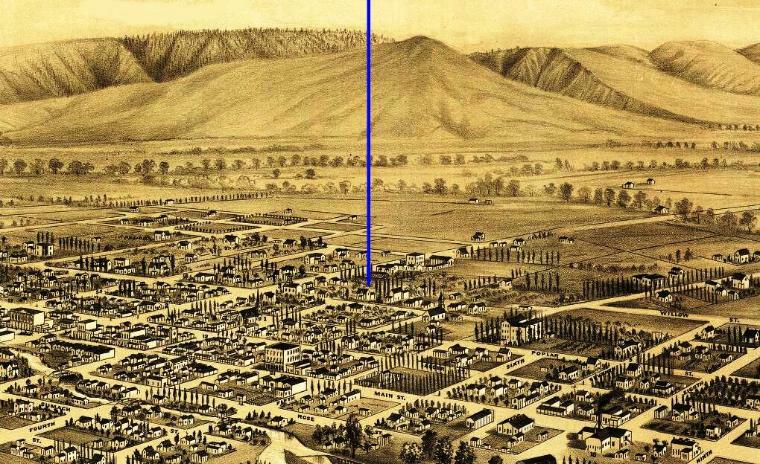 In 1901, a small group of Disciples from Prescott attended the yearly camp meeting at Dayton asking for help in establishing a New Testament church in their town. The group met in homes, the Methodist Church building and then in the I.O.O.F. Hall. The church was organized with 21 members and by 1909 had their own building. It was located at the southwest corner of Highway 124 and E Street. It shared the block with Geyer's Lumber Yard. Some of the preachers have been J. B. Daisley, J. V. Crawford and I. G. Shaw. There was no regular minister after 1928. Nearly all small congregations within a few minutes drive of a city congregation closed when the horseless carriages came to town.